Editor’s Note: This story shows how to avoid inadvertently losing your E&O insurance coverage for past work and being left unprotected, should a claim arise; the consequences to your business and personal life could be disastrous. Why Canceling Your E&O Can Really Cost You! As business slows, some of you are thinking about cutting expenses by either letting your E&O policy lapse (not renewing) or by canceling mid-term. This is what you ought to consider before cancelling or non-renewing your E&O insurance for any reason. Most professional liability insurance is written on a Claims Made basis. A claims-made policy protects an insured against covered claims or incidents that occur and are reported during the policy period. What does this mean? It means that if you face a covered claim today on a report you completed while insured in the past, you should have protection as long as the policy is in force. Switching insurance companies typically is not a problem because most issue “prior acts” coverage to qualified applicants. As the name implies, prior acts maintains coverage back to the start of the original policy. The key is maintaining continuous coverage, which means having no lapse in coverage. If you make the switch before your current policy expires and can provide acceptable proof of coverage to the new carrier, in most cases, the carrier you are moving coverage to will provide “prior acts.” It’s always best to ask your agent. If you let your claims made policy lapse, however, it no longer covers past work, even if you were covered at the time. Think of yourself in this scenario: you receive a threatening letter from an attorney regarding an appraisal you completed two years ago while insured. A year ago, however, you dropped your E&O thinking you didn’t need it and because you didn’t want the expense. Now the claim is no longer covered and you are on your own. Again, switching carriers is not typically a problem, as most insurers such as those that OREP works with, provide coverage for “prior acts” to qualified applicants. However, if you let your current policy lapse before binding with a new insurer, prior acts is not guaranteed. Each carrier has its own guidelines regarding the issuance of prior acts to new insureds but most allow only a short window in which to bind new coverage after the original policy has expired. If you wait too long, you’ll be out of luck. The same rules apply when renewing your policy with the same insurer. If you let your policy lapse by not renewing on time, you run the risk of losing all back coverage when your policy expires. 1.If you’re renewing your insurance, make sure you do so before your current policy lapses. It is not a good idea to wait until the last minute to renew for the reasons stated. Companies such as OREP mail renewal notices months in advance and make repeated attempts prior to expiration to verify that members who have not renewed are doing so intentionally. Most times clients simply misplace or forget their paperwork and are grateful for the follow up call. If a member is intending to renew, the message to them is loud and clear: get the renewal paperwork in ASAP before the policy expires! 2. If you are changing carriers, give yourself enough time to do so before your current policy expires and make sure that your new carrier is aware you have insurance. Most applications ask whether you have current coverage for this reason. 3. When corresponding with your insurance company, always follow up to make sure your fax, email or letter has arrived. It is OREP’s policy to issue same-day confirmation to clients. But it’s always smart to confirm that your application/renewal has arrived. It’s just too important not to. Several factors make carrying E&O insurance more important than ever. Unlike other professions, claims for appraisers and inspectors typically arise years after the date of the report. This is because claims often result from the subject property going into default- which usually takes at least a year or two. For this reason, it is vital to maintain coverage for all the work completed in the boom years, even if business is slow today. If you are not working and don’t want to continue your insurance policy into the future, another way to keep coverage for past work is to purchase “tail” or “extended reporting period” coverage. This covers past work for a specified period of time into the future. It is usually offered for a limited time after the policy expires, so don’t delay if you want coverage continued. If you don’t have E&O, today’s climate should give you pause to consider it. Appraisers are coming under greater scrutiny by lenders and regulators in the wake of the fraud epidemic and the rising number of defaults due to changing market conditions. When a loan goes bad, the appraisal is always examined. 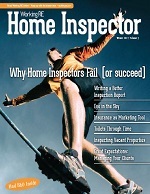 Home inspectors don’t need to be coached about the wisdom of carrying E&O. Claims for them typically happen soon after the date of the inspection. If your business is slowing, think twice about canceling your insurance to cut expenses. It may be a penny wise and a pound foolish should you face a claim and have to bear the burden of your own defense costs. If you don’t have insurance, the current climate makes it worth considering. The cost for insurance for appraisers is lower than nearly any other profession. OREP’s minimum premium is around $482. If you decide to cancel or not renew, ask your agent about “tail” coverage- to cover your tail. If you are retiring, purchasing tail or ERP coverage makes excellent sense. If you’re looking for great rates and fast, professional service, give OREP a call! It pays to shop OREP. Disclaimer: This article is written from an insurance perspective and is meant to be used for informational purposes only. It is not the intent of this article to provide legal advice, or advice for any specific fact, situation or circumstance. Contact legal counsel for specific advice. David Brauner is Editor of Working RE Magazine and Senior Broker at OREP, specializing in E&O insurance for appraisers, home inspectors, agents, mortgage brokers and other real estate professionals. Coverage in 49 states. www.orep.org (888) 347-5273.